Featuring the beloved voices of Martin Sheen and Amy Grant, All Creatures Big and Small relates the story of Noah’s Ark like you’ve never seen before! Get ready to ride the waves with Nestrians Dave and Finny, a clumsy species left off Noah’s list to board the Ark. With rough waters ahead, the father-son duo scrambles to sneak onto the boat. Caught in all the excitement, Finny gets left behind and must embark on an incredible and harrowing journey. 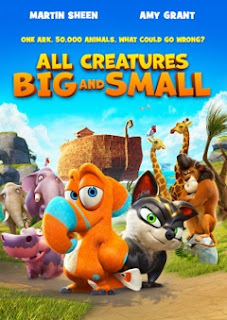 With the help of friends big and small, Dave must turn the Ark around to save his son in this heartwarming adventure of biblical proportions. oh wow, this movie should be so fun and sweet! Great for kids and with this cast, good for "big kids," too!